The times have changed a lot over the last two decades. Families are smaller, people are more independent and as we grow, we realize with pain that our parents and elders are growing old too. So today, it is not an uncommon sight to see an elderly couple or even just an elderly individual stay alone and fend for themselves. Well, it is not always that bad though. We have the technology to connect us to our loved ones and emergency services that come in a jiffy. So, it’s not that bad. That said, we can never be cautious enough about our safety and that of our loved ones. At ApartmentADDA, we are very respectful of the elders in our society and the thought of even one person being hapless in the time of need, makes us cringe. This made us want to put together an article that helps out all those strong senior citizens who spend time alone in flats and apartments in big cities. So if you have elders in your family, if you are a senior citizen yourself, make sure that this article is bookmarked. We never know, when we’ll need it. Set emergency contacts on speed dial on their phones. Introduce them to your immediate neighbors. Leave a word with the guards about the presence of elderly in the house and ask them to watch out for distress calls. Have security cameras installed your home so that you have eyes on them even while you are away at work. Keep the intercom phones on easy to reach surfaces. Write down important intercom direct dial numbers on a spot that is easy. Or even better, visit your physician and ask him to put together a custom made emergency kit for the senior in question. Having regular full body health checkups are a good step towards proactive health care. A secure home can make an ocean of a difference. Safe wiring, well-positioned kitchen, tiles with good grip in the bathroom and above all, security service and intercom are elements that go a long way in ensuring personal safety. Of course, not all of us can afford to appoint personal guards for our homes. So picking an apartment with enough security guards who can be easily contacted via the intercom is the best alternative we have. By now everyone must be aware of the fact that ApartmentADDA makes managing activities within a gated society a walk in the park. You might not be aware that we have a slick and feature rich App, which provides all the tools to ensure the safety of the elderly. Panic Alert: In case any apartment resident, especially senior citizens need any emergency help, then on the press of a button, immediate help can reach them. During any emergency at home in an apartment complex, the one’s who can rush to help are the neighbors and security guards. The panic alert helps achieve exactly that. The subsequent course of action like calling an ambulance, etc. can be managed by them. Monitoring Visitors: With the ADDA App, sitting at the office or from anywhere in the world, one can monitor visitors who are coming to visit your elderly parents/relatives at home. This ensures their safety, as no unwanted visitors can come and knock the bell. Discussion Forum: For any information related to the community, neighborhood or for getting any help at home, there is the discussion forum, where posting anything reaches the attention of all residents. Why are these features helpful? A lovely lady, aged around 75 resides in an apartment using ApartmentADDA and ADDA Gatekeeper. She resides with her kids, who are employed and are therefore, away during the morning hours. Thanks to her grandchildren, she is tech savvy. She can make calls, use WhatsApp to connect with her other children and even use the ADDA app to track their never-on-time maid. One day, this dear lady has a bad fall during her chores. She has a laceration on her head and she suspects a fracture in her leg. Immediate medical help is vital, especially given her age. Because she could reach her phone, she connected with her neighbors, alerted the main gate security, her children and even arranged an ambulance for herself. All of this, with just a few clicks on an app. In literally five minutes, people rushed to help her, all thanks to the ADDA app. Always leave a dim light on at night. And one in the bathroom as well. Keep the floor and all of the apartment in general, clutter free. 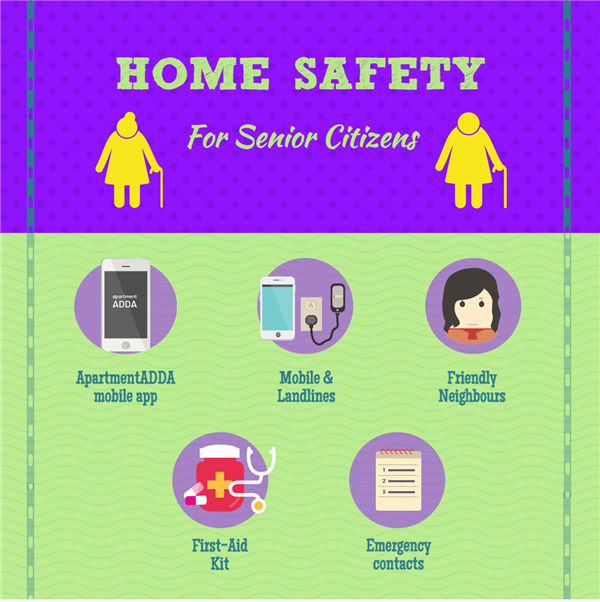 Slips and falls are a major cause of concern for senior citizens. A loud alarm/bell beside the bed to call for help ( in addition to the mobile phone). It is not unusual for the elderly to be forgetful of their health. So people around them must take the initiative to ensure that they are eating well and taking their medicines on time. Regular visits to the doctor are recommended for unexpected health issues. The younger members of the family owe them that much. They spent their youth caring for us and so, they deserve nothing but the best care and all the joy in their old age. So let’s all come together for that and spread the word. Share this with your friends and family who have elders in the home who needs taking care of. This is your way to do your bit and thank our elders for everything they’ve done for us.